Click here to read the consultation brochure. 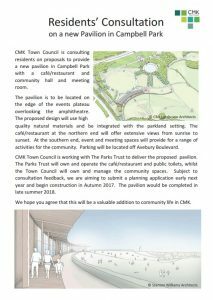 CMK Town Council is working with The Parks Trust to create a new community facility and cafe in Campbell Park. The facility will sit between the amphitheatre and the events plateau, creating a combined events space. The Town Council ran two public consultations in 2016 and 2017, with both indicated strong support for the project. A planning application was submitted earlier in the year, which has now been approved by Milton Keynes Council.